From minor repairs to heavy collisions repairs, you can always count on us at Hi Tech Autos & R.V. 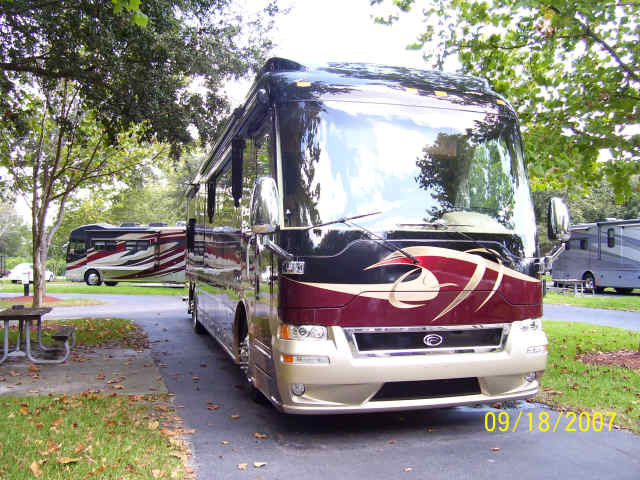 to restore your Motorhome to it Pre-Lost condition and if your not located in Florida…NOT A PROBLEM…If your motor home is immobilized,towing or transporting can be arranged from almost anywhere. We at Hi Tech Auto’s & R.V. understand that an accident is usually a very stressful experience.That is why at Hi Tech Auto’s and R.V. we offer a wide range of service and repairs to provide the Insurance Company and our customers with a hassle free experience while performing superior repairs. Hi Tech Autos & R.V. have a respectable relationship with all the motor home manufacture parts and warranty departments, so as we may be able to repair your motorhome in a timely fashion. We at Hi Tech Auto’s & R.V. are capable of performing repairs of motorhome’s buses, travel trailers, and 5th wheels.We have installed a new 55 foot paint booth, 7 work stalls, and a BASF & Dupont mixing labs. With state of the art digital camera’s to put your paint job back to it’s original finish. Hi Tech Auto’s and R.V. has a state of the art equipment to perform any job large or small.